- This track has been in the works for about five months now and I finally finished it up tonight. I was having some time issues and school got pretty intensive so for those of you who have been waiting that's why it took so long. Anyways, it is my third track, and it's a replica of Birch Creek Motorsports park in southwestern VA. I know alot of people on this forum have ridden there so it should be a fun track for you guys. I know some of the hills and obstacles aren't scale but it's still fun! So tell me what you guys think, what I could improve on, anything that's worth bringing up. 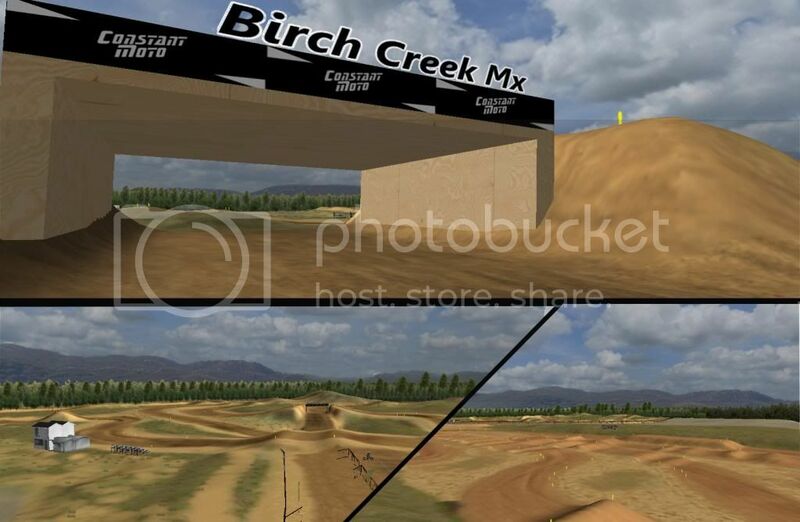 -The track also includes both the Sx and Mx track that they have there. Motoboss for ground textures from the Barcia Compound, ddmx for some of the objects on the track, smr510rr for the bleachers, Wilson for the registration building, and whoever made the ama stakes. Its a pretty good track but it doesn't seem to be very exact to the real thing..
supercross711 wrote: Its a pretty good track but it doesn't seem to be very exact to the real thing..
Looks awesome man, been waiting on this for a while! just wish it didnt say make a map..
i qualified for the unadilla regional here happy to play it in sim. Bryan Beaubouef wrote: just wish it didnt say make a map..
Yea forgot about that, realized after I put it up hear I hadn't made one. You can always just delete the map file in the folder and that will be gone.